After two consecutive losses, playing on the road against Louisville shouldn’t be the easiest way to get back to winning ways. But excellent defense from Duke as Tyus Jones and Jahlil Okafor rose to the occasion suggests that playing against more difficult opponents brings out the best out of the Blue Devils. After a sluggish start of trading blows, the defense from Duke took over, as Tyus Jones led his teammates on runs to open a 30-20 lead at half time, holding Louisville to under 25% from the field in the first half. Jones finished the game with 8 assists, and constantly had no problem blowing by the Louisville pressure and guards, who simply couldn’t get in front of him, especially when he had some head speed to back him up. It was one of the finest performances from Jahlil Okafor, scoring 18 points, 14 of them in the second half. He scored 16 of his points in the paint finishing with 8-of-9 from close range. 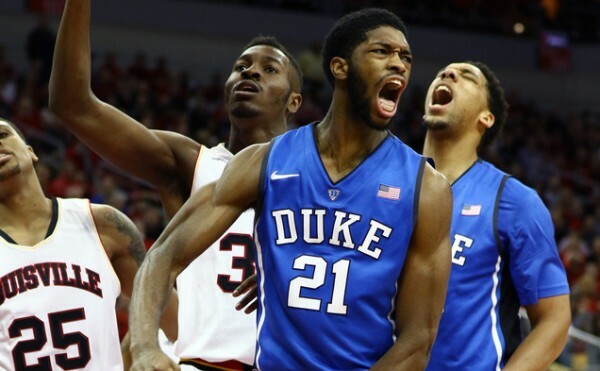 Both he and Amile Jefferson (19 points) found it very easy to score against the usually more difficult-to-handle Louisville bigs, and with every basket the discontent and friction among the Cardinals players grew, arguing over blown assignments and the like. Duke seem to thrive whenever their guards, or at least one of them, dominate. Okafor and Jefferson have been the constant even in the losses. Jones and Cook didn’t exactly shoot lights out in this win, but they were a lot more influential than in the losses to North Carolina State and Miami, when the shooting of the opposition was out of control. It had a lot to do with being unable to put any pressure on the arc in those games. Against Louisville, the slow ball movement from the Cardinals, with their players constantly falling into traps near the rim before kicking the ball out blindly, resulting in 10 turnovers while Quinn Cook had three steals off of those created a lot of opportunities for Duke to score points before Louisville had a chance to set up their famous full court press. Once you don’t allow them to get comfortable defensively, you put pressure on their shooting to come through, and they aren’t that good of an offensive team. I thought our offense was affecting our defense and we needed to change our point of pick up — whether it be man or zone — and put it at the top of the key. Try not to let people get points in the paint against us. Our guys did a good job of that. We ran a new offense, we had new plays. We did a lot of things differently and it really helped us out today.